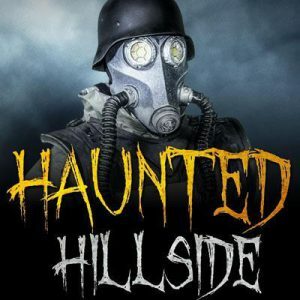 Haunted Hillside is a Haunted Attraction located in Mount Pleasant, PA. Team Scary Potter and the Hauntwarts Express reviewed this attraction on October 6, 2017. Ladies and gentlemen, let’s get ready to ruuuummbbbllleeee! This year it’s cult vs coven as Haunted Hillside erupts into a supernatural battleground that threatens to bring the whole Hillside (and, incidentally, the world as we know it) down in flames. Battling for control of a powerful demon unleashed several years-prior by a pair of nosy children, a murderous cult is battling a cabal of witches and, well, also-murderous hillbillies. Standing between these two destructive forces, hurtling at one another with irrevocable consequences… you. Welcome to Mount Pleasant, PA’s Haunted Hillside! “Exuberant” is certainly the best word to describe the overall demeanor of Haunted Hillside’s wicked brigade. Whether assailing us with verbal or olfactory greetings, each character chose a unique manner by which to introduce his sadistic intentions. In honesty, the variety of squeals, shrieks, sniffs, and emanations that I don’t even possess verbiage to properly define, was one of the best (per capita) that we’ve come across. The scarecrow who squeal-howled at us before we reached the third witch (I feel like I’m giving driving directions… sorry) had such a nearly-euphoric issuance we were forced to giddily recoil in satisfied appreciation. There were several other, similar happenings along the trail to a lesser degree. Sticking with the scarecrows, as the principle scare-force of this year’s adventure, we noted that they were especially adept at blending into their surroundings, both constructed or natural, as well as many impersonating inanimate props very well. The first faux-scarecrow-turned-real-scarecrow was the best at this (he executed the maneuver in two different instances with separate portrayals), and revealed himself in very effective, invigorated scares. Unfortunately, there were a few stretches of trail that needed to have a little more action occurring – actor-based or otherwise, particularly near the beginning. This wasn’t an issue later in the haunt, as even if an actor wasn’t immediately present for a prolonged stretch, the beauty/horror of the scenery was certainly stimulating enough. The trail was less interactive this year overall, but the second and third witches offered interesting, prolonged interactions. The greeter cultist featured the most entertaining exchanges, though. The actor was excellent at improvisational belittlement, providing every customer with a clever (and wildly insulting) pseudonym, and rolling with the off-color rebuttals he received. Our time spent in his care was very entertaining. Hillside kept it simple, which made sense considering that most of its denizens were scarecrows or sackboys. Though, we would have liked to have seen a bit more variation amongst the monstrosities; those that we did encounter were mostly well-designed with an eerie uniformity that was thematically consistent (one character designed all of the scarecrows to fulfill the same fundamental purpose). The straw-heads were most effective when garbed in full-body ‘Crow-wear, but even those only masked looked authentic enough, given their roles. The mouthless girl, the greeter cultist and the latter’s brethren in the finale were the visual highlights, but a certain conjured elemental received topped marks. We weren’t quite able to discern the constituent materials from whence he was birthed, but it was a unique organically-sinister construction. I first spotted Hillside’s spotlight perhaps fifteen miles away. If every other electronic device had suddenly failed me beyond that moment, I’m pretty sure I could have reached the haunt with minimal effort. When we arrived, a stampede of parking spotters directed us to our slot without issue. The layout of the concourse was significantly different from previous seasons, so it did take us a few moments to properly orient ourselves and figure out where to go, though. There are multiple portable toilet stalls… with built-in lights. Maybe that innovation is commonplace in other markets, but for us, this was a minor miracle. Anyone who’s been forced to self-illuminate their business in a port-a-potty understands our joy, I think. Additionally, a food tent (with very reasonably priced hot dogs and hamburgers) is available. On top of that, the main, permanent building in which tickets are purchased, has a wide variety of harvest fruits and vegetables, as well as cookies and other sweetness. Bubba has become a welcome staple among the Hillside’s actors and, this year, in tandem with his brood, he has assumed line entertainment duties. Skidding right up to the borders of decency and stopping, they maintained a thoroughly enjoyable collection of scripted and unscripted hazings and anecdotes, relieving every customer present of queue-boredom. They did a great job of harassing a group of patrons then moving on to another, ensuring that every waiting customer received an opportunity to be Bubba’d. All the while, a live band serenaded us. We really couldn’t ask for anything more. There’s just something about being located in the countryside that enhances a haunted attraction more than any gadgetry or artful set design ever could. Haunted Hillside is tucked away from civilization like a disruptive child in eternal time-out, past the point of ever rejoining his peers and reveling in the isolation. We did miss the central bonfire and movie screen this season (the movie screen is still present but in a less convenient location) and would have liked the hub area to be more concentrated like it has been in previous seasons. Still, the dark ambiance leading to the ticket area are excellent premonitions of the horrors awaiting beyond the tractor stop. The greatest upgrades this season were made to the trail itself. It’s obvious that a lot of effort was made toward producing as imposing and eerie a path as possible. The middle 70% of the trail, bolstered by a seemingly-endless combination of natural and artificial haze and a kaleidoscope of dim lighting, is every bit the antagonist of the experience as any masked menace. This “set design” looks better than it ever has, with thousands of tendrilic branches encircling the path as it winds from set to set. Nothing, we realized, beats the real thing, when it comes to designing haunted environments. The truly human-made effects, though scant at times, are always rendered more effective by the amplifying stature of the trail itself. The cemetery scene, our stand-out, is interwoven into the forested frame work, with an excellent light effect and a dozen creepy witch statues tucked into the shrubbery. Scarecrows (of the non-sentient variety) and the remains of government agents (as represented by hazmat suits) were scattered menacingly along the length of the trail. The ending scene was well-constructed; a self-contained horror experience promising one last nightmare-encouraging brush with the local populace. The other most impressive effects evident along the Hillside were the omnipresent sound effects. A variety of natural sounds, animal calls, ominous voices and mysterious throbbings accompanied our trek. They, too, enhanced the sense of continual dread. Had their been no actors, no props of any kind, and no direct scares, a trip through Haunted Hillside would have still been enjoyable due to the malicious melody and beautifully-chilling trail itself. I can’t think of a better location for a supernatural royal rumble with the fate of humanity in the balance (though, really, we lose either way) than a forest in the middle of nowhere and, after a strong dose of exposition, we were thrust into the fray, leading up to a suitable, no holds-barred climax. The attraction stuck to its thematic mantra, though we would have liked a little more interaction between the factions leading up to the final showdown. The haunters of the titular Hillside are so very greedy – they will be hidden, in plain sight or concealed by the environment, lock in their scare, and execute. However, for most of the creatures we encountered, a single fright was not sufficient to satiate their sadistic appetites. After initial interactions abated, they would disappear into the forest, regroup, and anticipate our next passage further along, repeating the process with malicious glee. The scarers at Haunted Hillside are persistent beyond all else – they WILL get their scares. The best scares that we encountered were assisted by distractions or through prop impersonation. The latter brand were the specialty of this season’s cast. We were never quite confident if the prop we had just passed had been real or a decoy until it was too late, falling victim to this clever ruse many times. Last season, we were disappointed that the impact of the previous iteration’s impressive finale hadn’t been replicated, but we are happy to report that this year’s Hillside has brought back another doozy of a final act. This crescendo was definitely the most lambastic, frontal assault scare of the entire affair, and is the perfect end-note. A single ticket to experience Haunted Hillside is $20 (or $17 online) and we clocked our journey at around 30 minutes – this puts the amount of entertainment per dollar spent at 1.5. Haunted Hillside is a great example of a quality attraction that relies on natural aesthetics and actor-driven scares to be successful over hi-tech effects and animatronics and succeeds again this season. It may seem odd to continue to praise, essentially, a path through the woods, but the minor intervention of a few sound and ambient effects and excellent trail accents really made this one of the most impressively-atmospheric walkthroughs we’ve experienced. That the actors are competent, exuberant and persistent makes it even better. Because of that, we definitely recommend a trip to the Haunted Hillside this haunted season. I went tonight and the haunted hillside def has potential to be a great haunt. Love all the …show more scarecrow masks and how they put people on the ground that move. But they definitely have a lot of open spots with no one at all around. Its just open space and you’re waiting for something to happen and nothing. Also never go on a night it just rained or has rained recently, we were sinking down in that mud soo much I hit right into a tree from sliding and its super slippery. They do a great job with the scarecrows just do not have a lot of actors at all. Seem to reuse the same ones in each scene and bunch a ton of the actors together. 3 chainsaws in one spot. The hayride is crap at the end they do not have one person scaring anyone. Its just a ride back to your car. I def would recommend this one on a better night but just really wish they could get more scarers and maybe shorten the trail so it doesn’t feel like you are needing to look for scares.